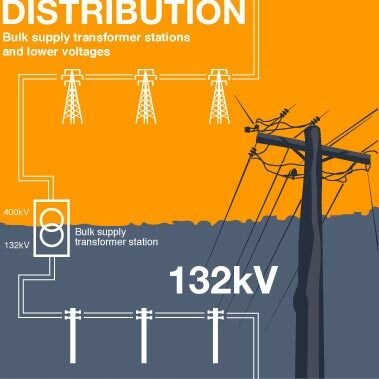 So, just how does electricity get from huge power stations to our power points at home? 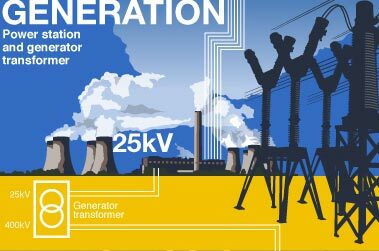 the electricity generation, transmission and distribution process. But we wanted to know more. We wanted to know about carbon emissions and about what's needed to get electricity into our houses so we can make a little more sense of what we see in the media. So, we asked him some questions. You can read our interview with him.  In the UK, six different energy sources are used as primary fuel for power generation.  Each has pros and cons.  Environmental impact is calculated by adding together DIRECT and EMBODIED energy costs  embodied energy is the energy it takes to extract and transport the fuel.  The fuel is used to heat water, which drives the motion of huge turbines. The ever-moving turbines produce the electricity.  It is produced at a value of 25kV (25,000 volts).  The newly-generated current is fed through a series of transformers that step the voltage up to 400kV  it's more efficient to distribute it at high rather than low voltage, since this minimizes energy losses.  Electricity cannot be stored. It is transmitted as soon as it is produced. When consumer demand falls, power generation halts. 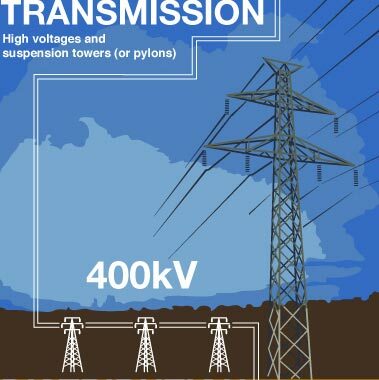  Electricity is transmitted across long distances via aluminium cables suspended on transmission towers (pylons).  Overhead cables are more efficient than underground cables for transmitting at high voltages  underground cables must be insulated to prevent short circuiting.  Transmission is at a higher voltage than generation or distribution, to maximize efficiency across the system.  The electricity is sent to bulk supply transformer stations, closer to end users.  These transformers step the voltage down to 132kV or 110kV.  At this voltage, it is distrubuted to individual or small groups of end users. 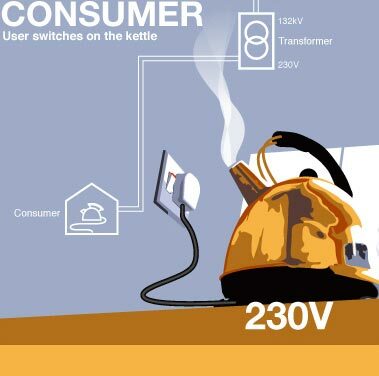  In the UK, electricity is distributed to consumers at 230 volts (standard UK voltage).  Transformers are used to step the voltage down from distrubution levels to consumer level.  Energy losses increase with this drop in voltage, so larger cables used are used inside buildings to compensate.